The Postal Service’s earnings during the busy holiday season fell once again in fiscal 2018, with controllable income dropping by nearly one-third and leading to a net loss of $540 million. The mailing agency saw a controllable income—in which USPS excludes items that are out of management's hands, such as non-cash workers’ compensation—of $353 million during the Oct. 1, 2017-Dec. 31, 2017 period. That was down from $522 million during the same period in fiscal 2017, which itself was down from $1.1 billion in fiscal 2016. USPS blamed the losses on decreases in first-class and marketing mail volume, higher retiree health care expenses and an increase in transportation costs. The agency brought in a total of $19.2 billion in total revenue, unchanged from a year prior. 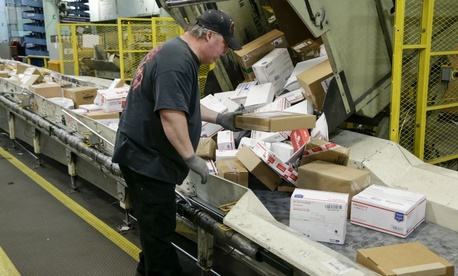 The Postal Service’s operating expenses increased by 11 percent, however, to $19.7 billion. That was in part due to the continued growth of the more labor-intensive package business, which saw a 7 percent uptick in the quarter. Mail volume, on the other hand, declined by 2 billion pieces, or 5 percent. In a bit of positive news for the Postal Service, the agency set an all-time record for most packages delivered on a single day, dropping off 37 million parcels on Dec. 18. The Postal Service typically enjoys its best performance of the year during its first quarter, as the holiday season provides a major boost to shipping. Despite still turning a controllable profit, Postmaster General Megan Brennan said the growing costs and declining mail volumes have put USPS on an unsustainable fiscal track. In December, the Postal Regulatory Commission blocked USPS from obtaining full autonomy in setting its prices. Instead, PRC continued a regulatory cap on the agency’s rate hikes while allowing more wiggle room in how much the Postal Service can increase its prices. The Taxpayers Protection Alliance, a libertarian-leaning group that has butted heads with postal management, called on the Postal Service to focus on its overall losses rather than its controllable profit. Fredric Rolando, president of the National Association of Letter Carriers, drew a different conclusion.